My mom loves library sales. Especially the kind where you pay a few dollars for a big paper bag that you can fill up with as many books as you can carry home with you. She's a very thoughtful lady, so she always fills her bag with books (and VHS tapes) she thinks we'll be interested in. Recently, she gave me a book called The Los Angeles Times California Cookbook (of course, because I live in California), which she picked up at a library sale in my hometown in Massachusetts. The cookbook includes recipes that "illustrate the California style, with its outdoor life, accent on fitness and good nutrition, fresh garden produce, and tropical foods." It was published in 1981. As of last night, I had yet to crack open the Calfornia Cookbook, but - having identified myself as a California stereotype from 1981 - I felt obliged to check it out further. And it was time to get some inspiration about what to do with the rest of my pile of lentils. Yup, they were still in my fridge, despite my dedication to eating at least a serving of lentils per day for the past week or so. It was time to get rid of them once and for all. Mash lentils slightly. Stir in bread crumbs, wheat germ, onion, salt, eggs, and Worcestershire. 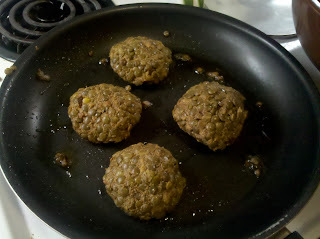 Form into six 3 1/2 inch patties, using 1/2 cup lentil for each. Heat oil in large skillet. Cook patties until golden brown on both sides, about 5 minutes. 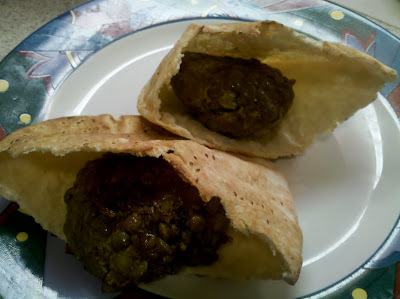 Serve in whole wheat pita breads, if desired. Well, there would be a few steps to veganizing this recipe. First of all, Worcestershire sauce has anchovies in it, so I can't eat that. I decided to substitute soy sauce because, well, it's soy. Second, the eggs! Eesh. I was skeptical of the powers of ground flax seed after getting macarooned the night before, but I didn't have another option. I decided to substitute flax seed for the wheat germ, too, since I just didn't have any wheat germ lying around. This was the most successful vegan cooking night I've had so far. The lentil burgers are delicious (thanks, California Cookbook!) 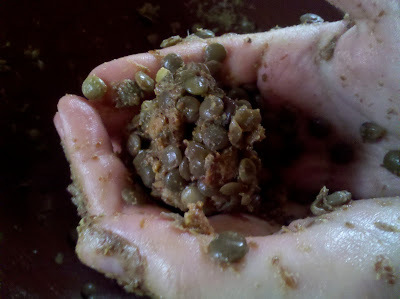 and as a plus, I got to use up the rest of those silly lentils. Hi Meghan the veghan! I just knew that cookbook would come in handy. Glad that you are finding lentils, yummy. Did the websites that I sent you have tasty treats? Yes they did! Thanks for sending me those links. I love collecting vegan recipes wherever I can. Happy Easter! My parents used to make this recipe when I was a kid growing up in LA. My dad worked for the LA Times, so we had all these books, and my mom was a vegetarian, this was a regular meal in my house. I am planning a vegan birthday party for a friend and asked my mom if she still had the recipe, but she couldn't find it. I was sooo stoked to find this, and vegan-ized too! Thanks!